*Judging by the reaction in the media, you would think that at the first debate Barack Obama fell asleep at the Colorado podium, set fire to a John Elway jersey and started singing all of Nickelback’s catalog, all while Mitt Romney was nursing a baby bald eagle back to health by wrapping it in an American flag. Let’s slow everything down. Was it a win for Romney? Sure it was. He was on point, on message, and looser and more congenial than his normal Mitt-bot persona. Was it a loss for Obama? Yes it was. He wasn’t very good. He was passive and stumbling, trying to avoid a conflict instead of taking his message to Romney (check out Joe Klein’s piece on Obama for a more detailed analysis). The problem is that he’s not a great debater. He’s too much of an intellectual to be captivating in those formats; when he speaks in a debate, you can hear the wheels creaking and turning in his skull. His answers are riddled with think-pauses and “ums.” It takes him out of his teleprompter / big speech comfort zone he’s usually so good in. 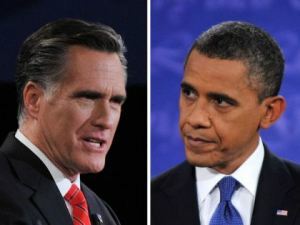 Going into the debates, the conventional narrative was that Romney wasn’t a skilled debater either. However, one has to wonder how much of that perception was based on assumptions from the historically-weak Republican field that he had to contend with on his road to the nomination. After all, a piece of wood with a cartoon character’s face on it would serve as a more worthy opponent than Rick Perry. In the first debate, at least, Romney was solid enough to make an impact. So, this one was a win for Romney, but almost by default. He had nowhere else to go but up after a horrific September, and the “woe is Mitt” narrative had gotten old in the media. This was set up to be a comeback bid, and give him credit – he delivered a solid, winning performance. However, there is a long, long way to go before November 8. Barack Obama still has his leads in the swing states. He’s got a ton of cash on hand. He’s got two more debates and an entire month of campaigning left to strike back. Most importantly, Obama is far, far too good of a politician and too smart of a guy to stay on the mat too long.